Traumatic brain injury (TBI) is the leading cause of death and disability in children and young adults. Causes of TBI include accidents (e.g. car, motorcycle, bike, etc. ), sports activities (e.g. hockey, football, skiing, lugging, climbing, etc. ), work-related injuries, falls, and violence. TBIs incur huge costs on society and dramatically reduce the quality of life for the individuals involved. Wearing a helmet can considerably reduce the number and severity of TBI. In general, the majority of helmets available in the market only protect the wearer’s head from linear acceleration, that is, compression and bruising caused by sudden stop of the head. During an accident when the helmet comes forcefully into contact with a barrier such as a road, its outer shell catches against the pavement and results in the helmet very swiftly twisting around. Within milliseconds, the wearer’s head rotates with the helmet. The rotational acceleration is so high that the brain cannot keep up with the skull’s rotation causing shearing of nerves and blood vessels, resulting in disabilities or even death. Research studies have shown that rotational acceleration is the major cause of brain injuries. In many cases when linear acceleration of the head from an impact is in the acceptable harmless range, the rotational acceleration can still cause significant injuries. The Head Injury Prevention lab has been working for three years to reduce head injury and improve headgears’ design. Our research study resulted in inventing a new generation of safety enhancing add-on patch for helmets. Unlike other designs, Impact Diverting Mechanism (IDM) design does not require changing the structure of headgears, and it simply retrofits a very thin and featherlight layer, almost invisible, on helmets. 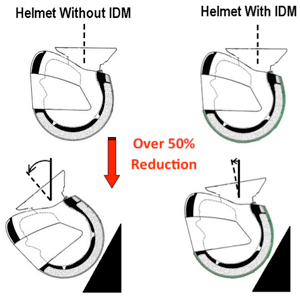 The IDM greatly improves the safety effectiveness of a helmet, through the reduction in rotational and linear acceleration experienced during an accidental impact of the head. The IDM is able to reduce rotational acceleration of the head during an accident by over 50%, and linear acceleration by over 10%, leading to significant reduction in head injuries. The IDM patch can be applied to all types of helmets that are used to reduce the effects of accidental impact during activities such as driving a motorcycle, riding a bicycle, or engaging in sports like football or hockey. It can be manufactured at a very affordable price, and can be implemented in both complete and after-market (add-on) models. In addition to enhancing the protection of wearer against head injury, the add-on patch can offer other features such as improving visibility in low light conditions, and advertising. The graph below shows the results of our standard oblique impact tests on helmets with and without IDM installed on them. 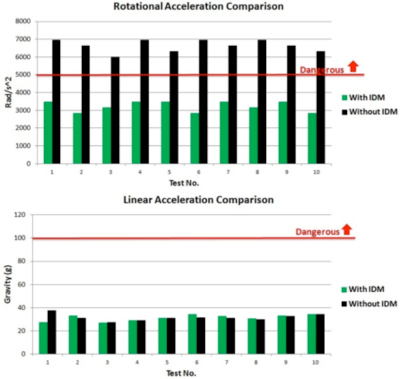 As shown below, while the linear acceleration is considerably lower than being injurious, the rotational acceleration of the helmet without IDM can cause serious brain injury. Several prototypes have been created and tested to demonstrate proof of concept and validity of claims. A patent application has been filed respecting the key innovative elements of the design. The team is currently working on the manufacturing process of the design.